This is my kind of salad; full of crunchy texture and bold flavor. Pretty much any time blue cheese, toasted nuts and fruit are together I’m sold. This is one of those recipes I would encourage you to play with according to your tastes and what you have on hand. 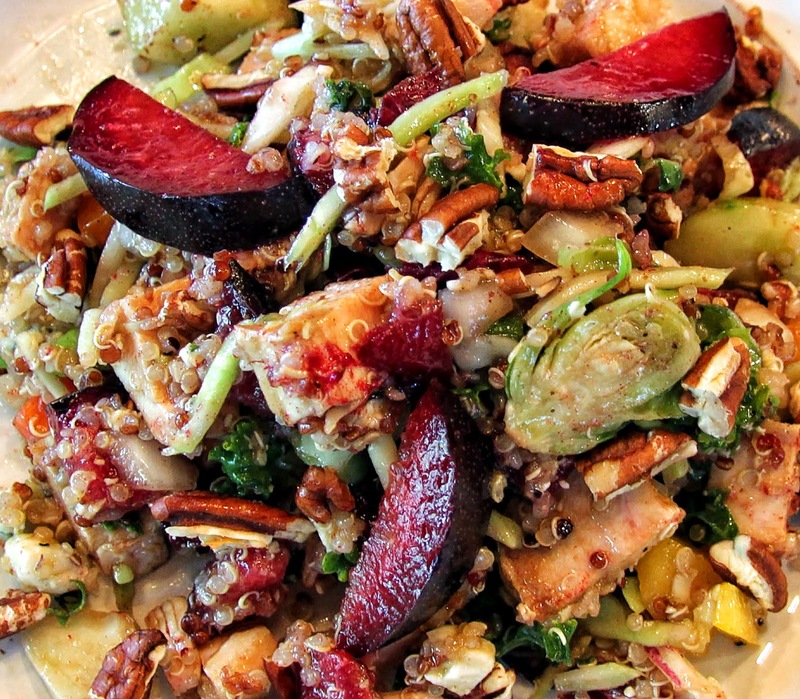 For example, I am out of the delicious pluots I used when I made this the other night but I plan to make a version with fresh cherries tonight and I may even get crazy and substitute almonds for the pecans. 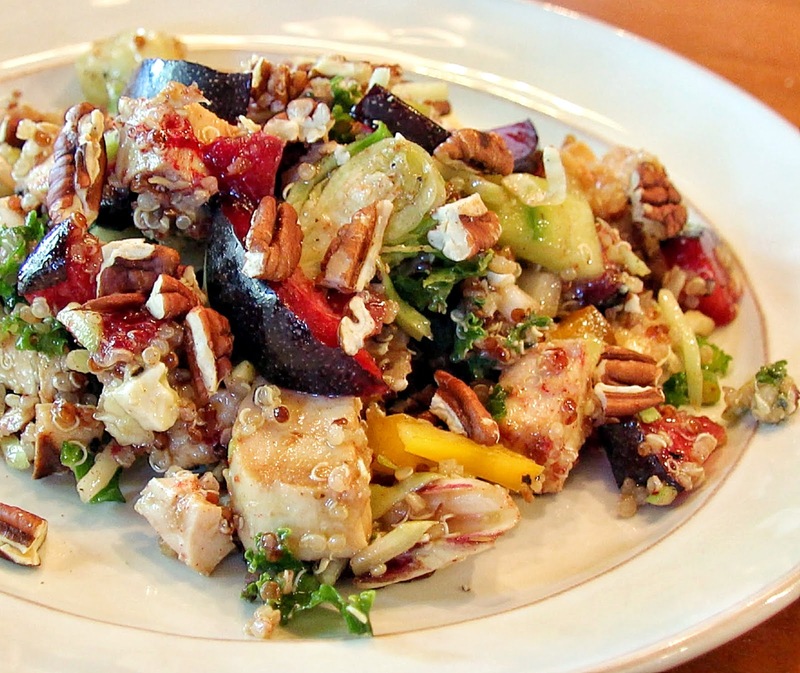 The exact mix of veggies is up to you as well but it’s important they be hearty and crunchy – no wimpy lettuce please. 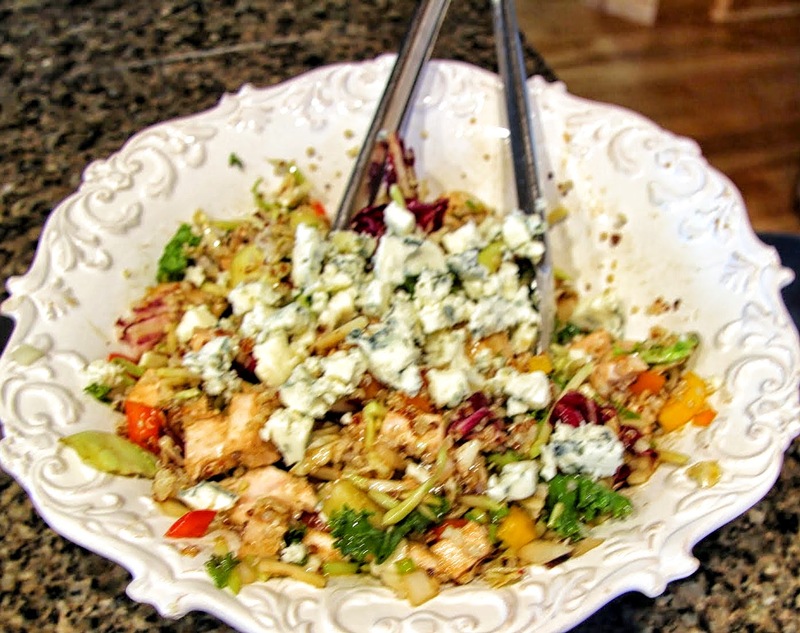 That way you can make the salad ahead of time and keep it in the fridge, ready for an easy summer supper. 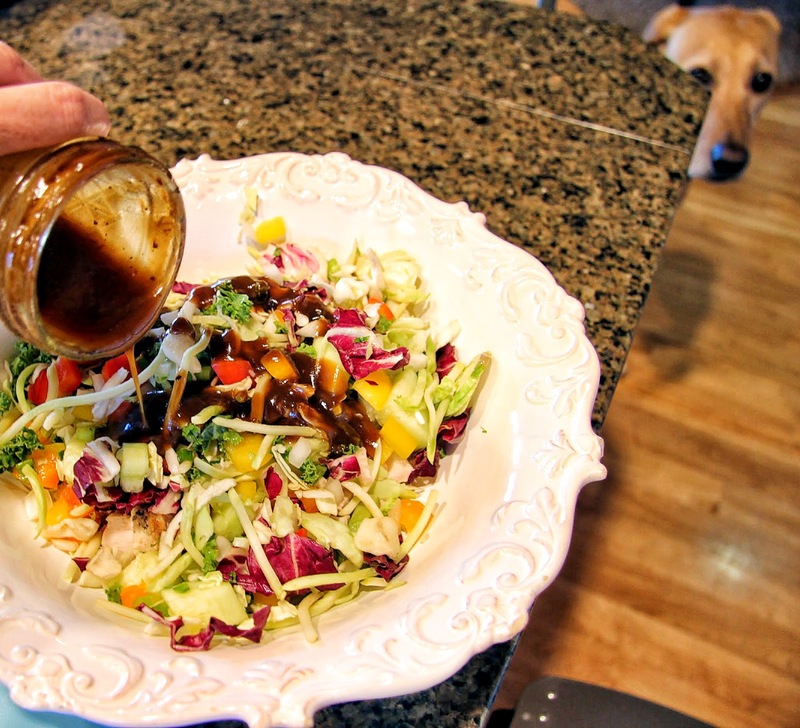 I try to keep cold, grilled chicken on hand when the weather’s hot for salads such as these using my Easy Citrus Marinade recipe before grilling and chilling. Of course, any form of cooked chicken breast will do. 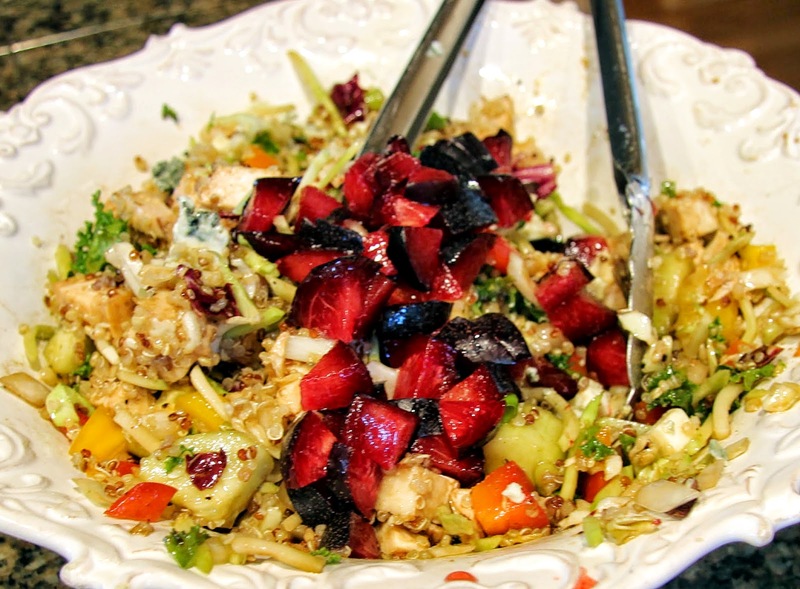 The addition of the chicken and quinoa makes for a super satisfying, healthy meal with tons of protein and fiber that tastes like a treat to me! 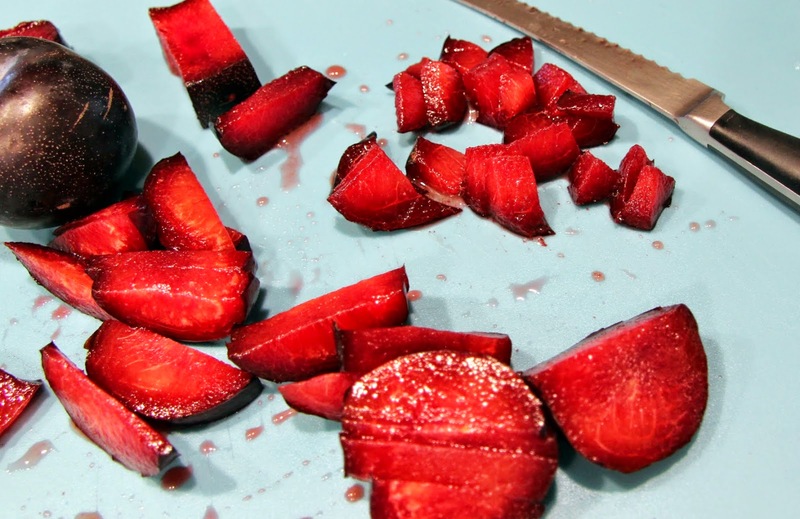 In case you’re not familiar, a pluot is a hybrid fruit with the flavor, color and tart skin of a plum but with the more dense texture of an apricot. Not being wild about plums or apricots on their own, I had seen them but never actually eaten one before. Earlier this week though, my girls had me sample some at the farm stand and I found them to be delightful! They are perfect paired with blue cheese because the sharpness of the cheese tempers the tartness of the pluot skin and you are left with the sweetness of the fruit. One last thing. I implore you to use toasted nuts. I know Dr. Oz says raw nuts are healthier and, while I’m sure that’s true for some, toasting them makes all the difference in flavor and that makes me very happy, therefore, healthy. Because really, what’s the point of being healthy and not happy? I think we should all be asking that question more. I recently had a high priced salad at a local restaurant and two things pretty much ruined it for me. One, it was overdressed. Two, raw pecans. Not good. Not good at all. If I were the type of person to ever complain in a restaurant I probably would have done so but that would have made me stressed, therefore unhappy and yes, unhealthy. You get it. Oh, also, add the nuts just before serving so they stay crunchy! 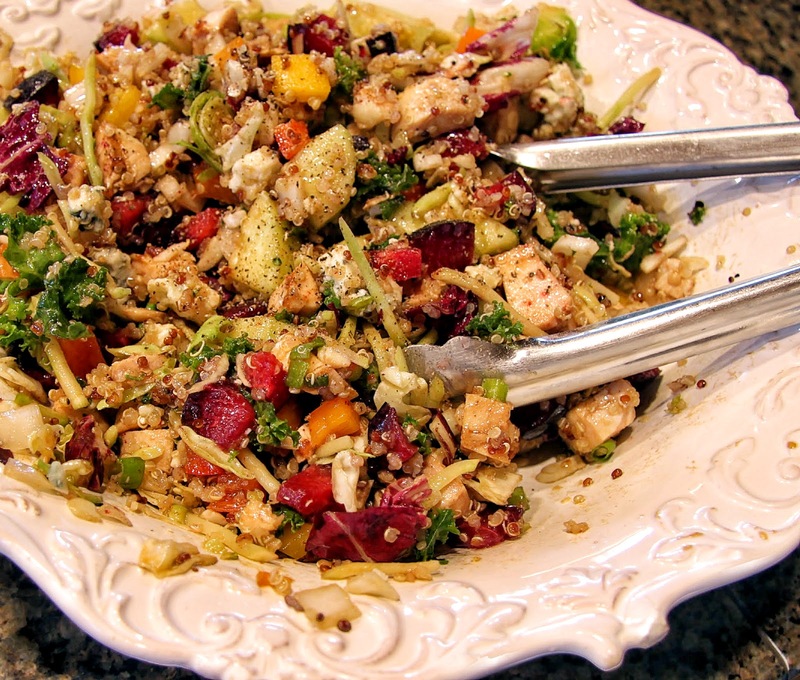 Make sure you have the chicken and quinoa cooked ahead of time. Just cook the quinoa according to package directions and refrigerate what you don’t use for the salad. Also, if you are using raw pecans, toast them in 350 degree oven for about 10 – 15 minutes, checking often to make sure they don’t scorch. 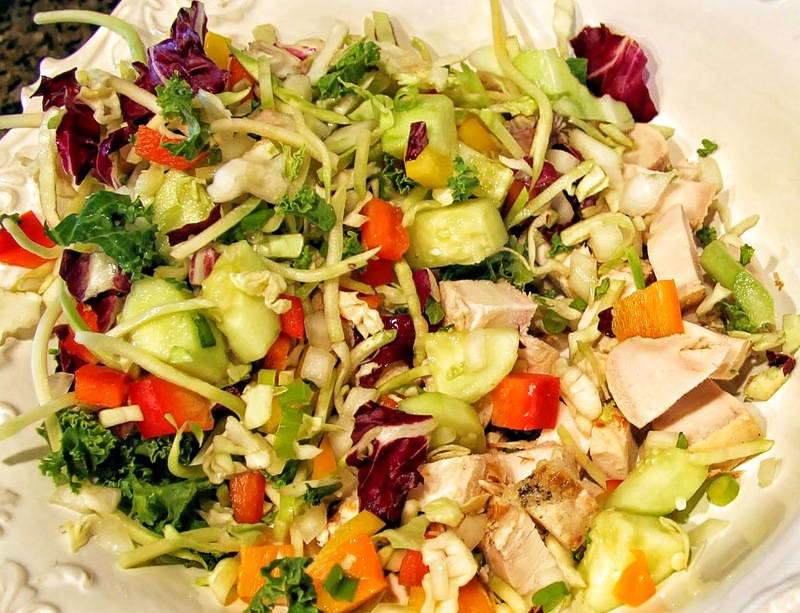 In a large salad bowl, combine all of the veggies and the diced chicken. Add a couple tablespoons of dressing, salt and freshly ground pepper, and toss. 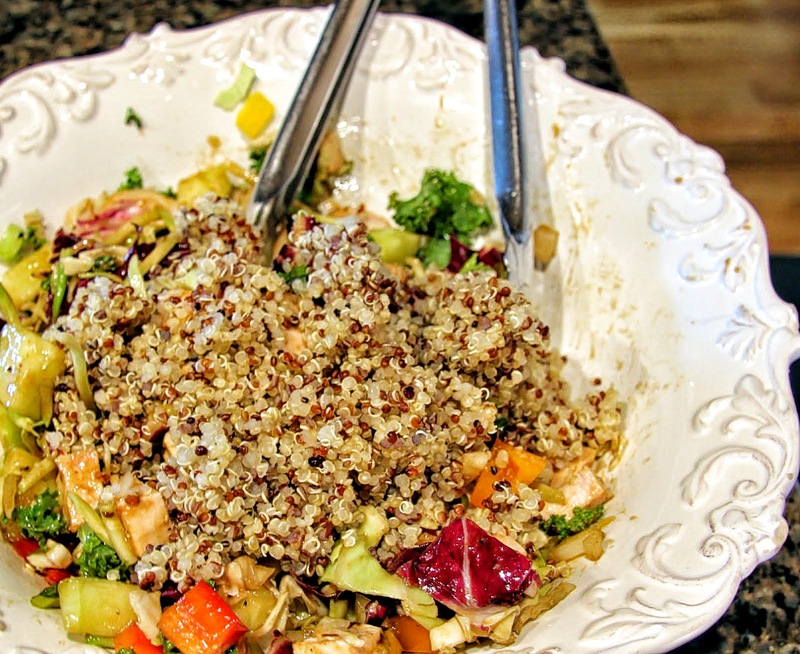 Toss in quinoa, a little more dressing, salt and pepper. Slice and dice pluots, keeping skins on. Gently toss in the salad. If not serving right away, refrigerate until ready to serve. Top with pecans just before serving. Enjoy the sweet, salty, nutty crunch! It’s a “super moon” tonight which thrills me because I always feel strengthened by a full moon!